1.CVC MATERIAL: The CVC material combines advantage of polyester and cotton, which is not easily wrinkled, easy to wash and quick dry. 2.SIX HOOK&LOOP FASTENERS: Fix with the liner of your safety helmet firmly with 6 hook&loop fasteners. 3.WIDEN BRIM: Widen brim can block sun's rays keeping workers comfortable in environments absent from other forms of shade. 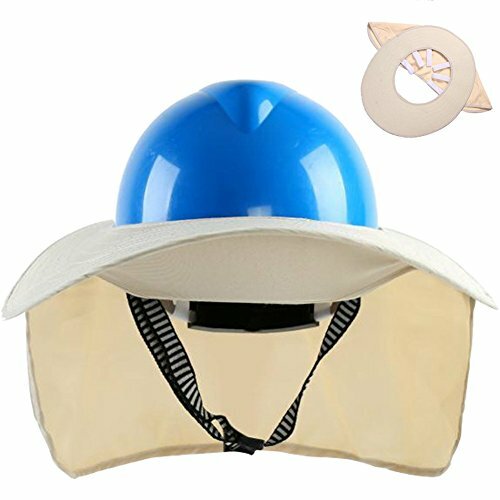 4.APPLICATION: The Sun Shield is perfect for construction workers, firefighters, motorcyclists, and anyone who is exposed to heavy amounts of sunshine. CVC MATERIAL: The CVC material combines advantage of polyester and cotton, which is not easily wrinkled, easy to wash and quick dry. SIX HOOK&LOOP FASTENERS: Fix with the liner of your safety helmet firmly with 6 hook&loop fasteners. WIDEN BRIM: Widen brim can block sun's rays keeping workers comfortable in environments absent from other forms of shade. APPLICATION: The Sun Shield is perfect for construction workers, firefighters, motorcyclists, and anyone who is exposed to heavy amounts of sunshine.